and Heavy Duty Bariatric Equipment. Scroll down to see our selection of Bariatric Equipment for sale. Bariatric Equipment for sale. We have a large selection of heavy duty bariatric equipment for the home, facility and clinical settings. We carry many different brands and styles of bariatric equipment products and supplies. Bariatric equipment is often very hard to find. We carry several different product lines of bariatric equipment for the bedroom, bathroom and mobility devices. What is bariatric equipment? 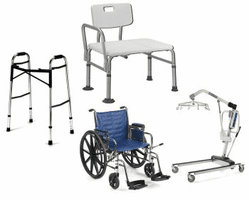 Simply put it is equipment and supplies that are designed for larger or obese patients. Most equipment that is defined as bariatric has a 300+ pound weight limit with many of the items we sell having as much as 900 pound weight limits or more. We have a large selection of bariatric products for sale including wheelchairs, walkers, transfer benches, hospital beds, chairs and much more. Bariatric Equipment design would include increased weight capacities, heavy duty support and wider widths to fit the larger persons needs. There is not a specific width or designated weight limit that defines bariatric products but as a general rule standard equipment has a 250 pound weight capacity and an 18" seat width. Products designed in excess of this is generally considered bariatric or heavy duty products. At one time this was a very limited product line but as the obesity problem continues to worsen more manufactures have begin to produce products for the bariatric patient's needs. Always carefully check the weight capacity and width needs before ordering to ensure a proper fit. Browse the Bariatric sections below, if you have any question feel free to call our toll free customer service number at 1-800-804-9549.